Microsoft Dynamics NAV is a business management solution for small to medium organizations. It offers customers a full solution for their business with greater control over their financials and business processes. 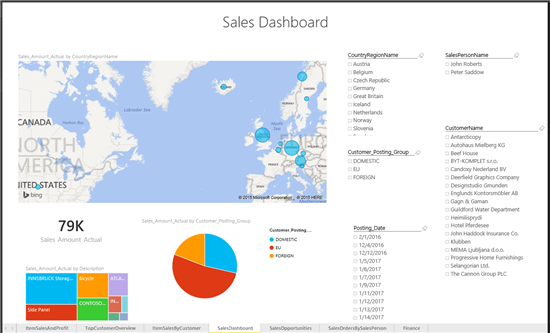 The Power BI content pack provides out-of-box reports for Dynamics NAV users, such as sales and profit, opportunities pipeline, profitability and more. These metrics are organized on a dashboard that can be fully customized, allowing you to easily connect and immediately start exploring your data. 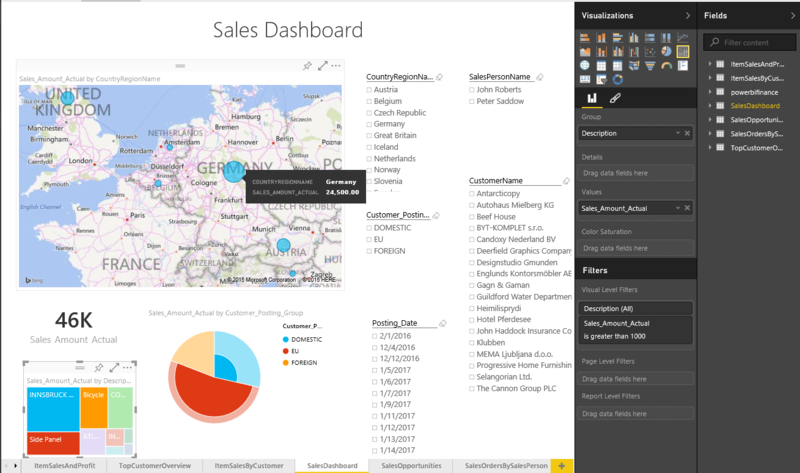 This post will explain how the Power BI content pack can help you explore your Microsoft Dynamics NAV data. For additional details on how to get started, please see the Microsoft Dynamics NAV content pack for Power BI help page. After connecting with your Microsoft Dynamics NAV credentials, your data will begin loading into Power BI and you will be notified when the dashboard is ready. In addition to the out-of-the box dashboard there are 7 reports built on top of the dataset. To begin exploring the reports select one of the tiles on the dashboard. For example, if you select the tile that shows Sales This Month it will drill into the Sales report. Each report includes a set of visuals with different insights. For additional information you can hover over any of the items, or select a particular value to cross filter other visuals on the page. The Sales report provides insights such as the sales amount by customer group and product. On this report you can select a specific salesperson from the salesperson name slicer to filter the data for that person. Any of the visualizations from the reports can be pinned to the dashboard by hovering over it and selecting the pin icon. In each of the reports you can switch to edit mode where you can edit or add additional visuals to your reports. After the initial import, the dashboard and the reports continue to update daily. You can control the refresh schedule by selecting the dataset. 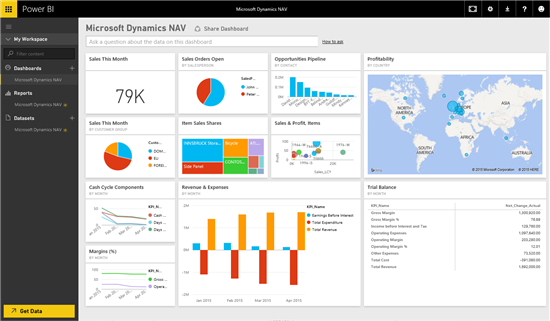 With the Microsoft Dynamics NAV content pack for Power BI, you have an initial set of metrics and insights enabling you to explore your data even further.